Product FeaturesHideaway designer caddyOpens with easeStores convenientlyNewell Brands Inc.,P.O. Box 156,Cinnaminson, NJ, 08077.www.quickie.comMicroban® is a registered trademark of Microban Products Company©2016 Quickie Mfg. 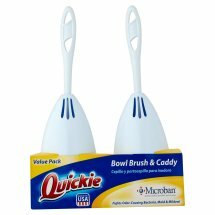 Corp. is a subsidiary of Newell Brands Inc.
©2016 Quickie Mfg. Corp. is a subsidiary of Newell Brands Inc.